There once was legitimate concern about whether Andrew Luck would ever play football again. There were even more questions about whether he would ever return to the elite level of play that he showcased just two years ago when he recorded an overall grade of 90.4 in 2016. The first six weeks of the season did not do much to assuage those concerns, as the Indianapolis Colts stumbled out of the gates to a 1-5 start. Luck wasn’t playing poorly with an overall grade of 80.4, which ranked 13th among quarterbacks, but he didn’t quite look the same. He had 12 turnover-worthy plays, which were the most in the league. He was averaging just 6.2 passing yards per attempt (31st in the league), and he was attempting passes 20 or more yards downfield on just 8.3 percent of his attempts (30th in the league). The questions continued to come – is the shoulder injury still bothering Luck and will he ever rejoin the NFL’s elite signal callers? It’s safe to say that Luck answered both of those questions down the stretch. He finished the season ranked third among all quarterbacks in PFF grade at 91.1 behind only Patrick Mahomes and Drew Brees. If it weren’t for the brilliance of those two, his name would be soundly in the MVP conversation. After that 1-5 start, the Colts only lost one more game the rest of the season, and it was due largely to Luck showing that the shoulder issues that plagued him for over a year were in the rear-view mirror and he was still in the elite tier of quarterbacks. New head coach Frank Reich has taken steps to help ensure that things remain that way by bringing with him a change in ideology for the Colts’ offense – highlight the quick passing game and get the ball out of Luck’s hands quickly to reduce the number of hits that he takes. Thus far, that strategy has worked. Luck has reduced his average time to throw from 2.9 seconds in 2016 to 2.5 seconds this season. Though that doesn’t seem like all that much, it’s an extreme reduction in the landscape of an NFL play where tenths of a second make an immense difference. 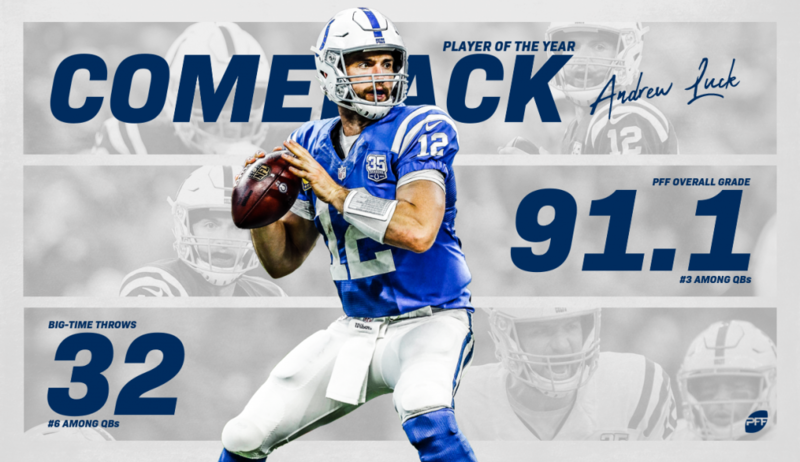 Because of that, Luck was kept clean on 70.5 percent of his dropbacks – up from just 55.7 percent in 2016 – which ranked second-lowest in the league. From those clean pockets, Luck threw 31 touchdown passes, which fell behind only Mahomes on the season. Most importantly, he has only taken 77 combined sacks and quarterback hits this year, which ranks 14th at the position. From 2012 to 2016, he took 528, which was 34 more than anyone else. The Colts put an emphasis on protecting their franchise by investing in the offensive line through the draft and instituting a passing attack that features quicker releases, as they should. A healthy Luck has revitalized their offense and has a team that earned the number three overall pick just a season ago in the playoffs. With that, he left the decision for PFF Comeback Player of the Year as a rather easy one.